SEATTLE—April 10, 2014—(NASDAQ: AMZN)—Amazon.com today announced that it has reached an agreement to acquire comiXology, the company that revolutionized the digital comics reading experience with their immersive Guided View technology and makes discovering, buying, and reading comic books and graphic novels easier and more fun than ever before. ComiXology has revolutionized the comic book and graphic novel industry by delivering a cloud-based digital comics platform that makes discovering, buying, and reading comics more fun than ever before. ComiXology’s Guided View™ reading technology transforms the comic book medium into an immersive and cinematic experience, helping comiXology become a top ten grossing iPad app in 2011 and 2012 and the top grossing non-game iPad app in 2012 and 2013. Offering the broadest library of comic book content from over 75 publishers – and independent creators as well – comiXology will not stop until everyone on the face of the planet has become a comic book fan. ComiXology is based in New York City, with offices in Los Angeles and Paris. Amazon.com, Inc. (NASDAQ: AMZN), a Fortune 500 company based in Seattle, opened on the World Wide Web in July 1995 and today offers Earth ’s Biggest Selection. Amazon.com, Inc. seeks to be Earth’s most customer-centric company, where customers can find and discover anything they might want to buy online, and endeavors to offer its customers the lowest possible prices. Amazon.com and other sellers offer millions of unique new, refurbished and used items in categories such as Books; Movies, Music & Games; Digital Downloads; Electronics & Computers; Home & Garden; Toys, Kids & Baby; Grocery; Apparel, Shoes & Jewelry; Health & Beauty; Sports & Outdoors; and Tools, Auto & Industrial. Amazon Web Services provides Amazon’s developer customers with access to in-the-cloud infrastructure services based on Amazon’s own back-end technology platform, which developers can use to enable virtually any type of business. Amazon Fire TV is a tiny box that plugs into your HDTV for easy and instant access to Netflix, Prime Instant Video, Hulu Plus, WatchESPN, SHOWTIME, low-cost video rentals, and much more. Kindle Paperwhite is the world’s best-selling and most advanced e-reader. It features new display technology with higher contrast, the next generation built-in light, a faster processor, the latest touch technology, and exclusive new features designed from the ground up for readers. Kindle, the lightest and smallest Kindle, features improved fonts and faster page turns. The new Kindle Fire HDX features a stunning exclusive 7” or 8.9” HDX display, a quad-core 2.2 GHz processor, 2x more memory, and 11 hours of battery life, as well as exclusive new features of Fire OS 3.0 including X-Ray for Music, Second Screen, Prime Instant Video downloads, and the revolutionary new Mayday button. The all-new Kindle Fire HD includes an HD display, high-performance processor and dual speakers at a breakthrough price. This announcement contains forward-looking statements within the meaning of Section 27A of the Securities Act of 1933 and Section 21E of the Securities Exchange Act of 1934. Actual results may differ significantly from management’s expectations. These forward-looking statements involve risks and uncertainties that include, among others, risks related to competition, management of growth, new products, services and technologies, potential fluctuations in operating results, international expansion, outcomes of legal proceedings and claims, fulfillment and data center optimization, seasonality, commercial agreements, acquisitions and strategic transactions, foreign exchange rates, system interruption, inventory, government regulation and taxation, payments and fraud. More information about factors that potentially could affect Amazon.com‘s financial results is included in Amazon.com‘s filings with the Securities and Exchange Commission, including its most recent Annual Report on Form 10-K and subsequent filings. 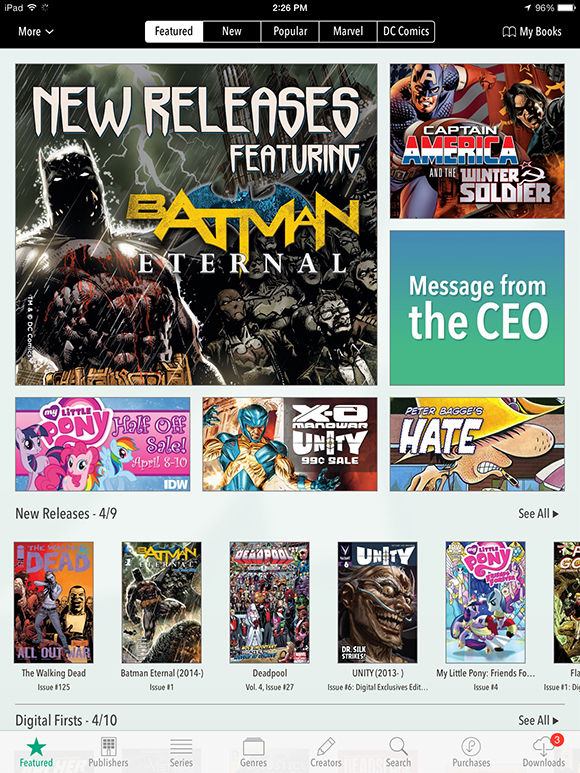 What do you guys think of Amazon acquiring comiXology? Does this make you want to read digital comics now?